The infamous photo from the United States victory over Japan in WWII represents America at its finest. The Sailor in the photo who is kissing the girl, George Mendonsa, passed away Februaury 17th, 2019. Mendonsa was shown kissing a woman he never met, Greta Zimmer Friedman, a dental assistant in a nurse’s uniform, on Aug. 14, 1945. Known as V-J Day, the day Japan surrendered to the United States. People filled New York City streets to celebrate the news. 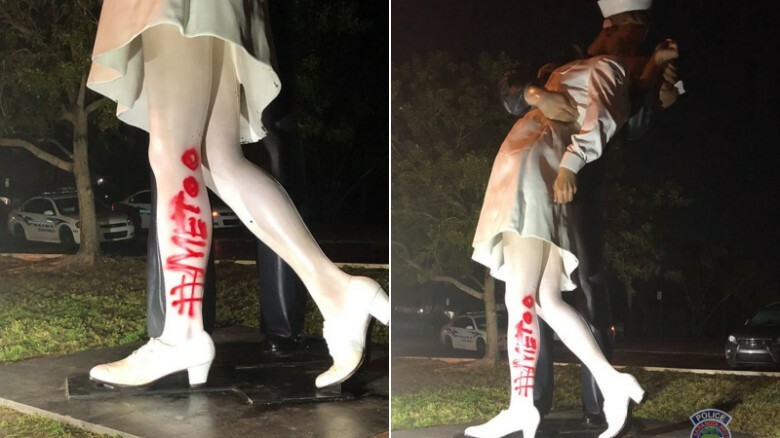 Just a few days after Mendonsa passed away a statue in Florida commemorating the photo was vandalized with spray paint saying #metoo While no nation is perfect nor is this countries history without it’s flaws, we can’t change history by maiming or destroying it. In fact, you can’t destroy it. It is what it is. In those days, despite great divisions in this country and great discrimination, we had a national identity and a common goal. What’s so terrible about a man kissing a woman in celebration of the end of one of the most horrific wars in history? I’m sure the same people who spray-painted the statue are individuals who worship celebrities like Kim Kardashian who got famous by being the girlfriend of former RnB star Ray J in a pornographic film. What an empowered woman. Or maybe the people who did this are a little more high brow and prefer shows such as Jerry Springer, or The Bachelor, or Teen Mom 2. On such sophisticated programing you get to watch drunk women throw themselves at and kiss unsuspecting men. While I’m glad we’ve gotten past some of the sins of our past as a country, such as slavery and Jim Crow, I’m sad to see our culture devolve in to a society of self important idiots who find desecrating a statue that represents victory over evil as being good, when in fact the opposite is true. While we as a nation will never forget slavery and Jim Crow, nor should we, we should also never forget or desecrate the homages dedicated to the real men who gave everything to save our nation from evil. One of those men who gave everything for this country was Fearless Freddie Warder. While in his life he kissed 3 women I’m aware of, his 3 wives, he also was kissing enemy Japanese Cruisers goodbye with his Mark 14 torpedoes. Whoever vandalized that statue deserves a swift kick in the… you know what. Check out the film Fearless Freddie here and learn about one of the great men that helped win the War in the Pacific.